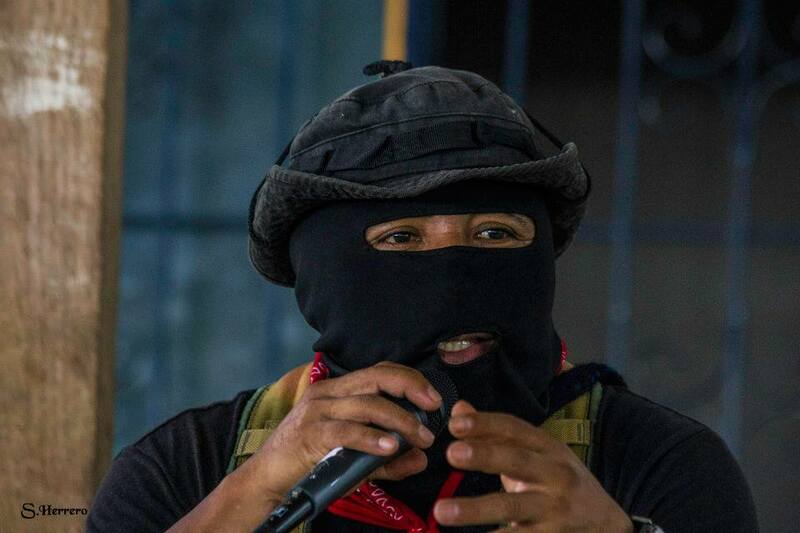 Well, compañeros, compañeras, you heard what Subcomandante Insurgente Galeano said. This is what we see; this is what we think. We need one another’s strength, because if we understand how life is, then we must also understand that we need to link ourselves together. You saw and heard some of the other compañeros who were here as part of the free media but also part of the CNI. Now you [from the free media] should have an exchange amongst yourselves, because sharing in an exchange is not the same thing as speaking without having listened. It is through sharing that we realize that we have to link ourselves together, that we have to grab onto each other’s hands. The question is, as we asked the compañeros of the National Indigenous Congress, what is it that we have to grab onto together, indigenous and non-indigenous people, can we speak in one voice? Yes. 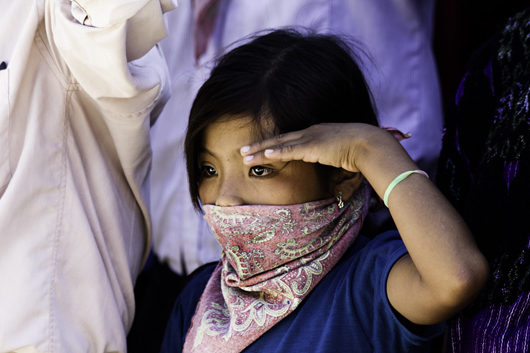 The [indigenous] compañeros understand the life of those who are not indigenous. So how will we do this? How will we struggle? In other words, our already large task is even greater, and we think that it is even more difficult for those who live in the city, although it is also hard for those of us who live in communities, like those of the National Indigenous Congress. At least in the communities there is still a life in common, but in the cities there isn’t. There, in the city, behind the fences where one lives, people don’t know their neighbour’s problems, sometimes they don’t even know who their neighbour is. Even sharing three walls—I might live here, and some other neighbour lives over there, and someone else over there—my neighbour isn’t concerned about what is happening with me and I am not concerned with him or her. One after another people live like that. And so it is a very large task, especially given what is coming, what the compas call “the coming beast.” But among all of us we will destroy it. The question we have to answer then is: how can we do this work? That’s what we think. We are not asking you to become indigenous, but you also shouldn’t ask us to think like or be like the people who live in the city. No. Each of us struggles, but we are united. Remember what the late SubMarcos used to say: for all we have heard and all the listening we have done in the different caracoles where we have held encounters, and where we have tried to determine and say what is most important, even then—certainly it has happened multiple times here—we don’t manage to create an agreement. Everyone thinks they have the best idea and there is no agreement because everyone wants their particular idea to be accepted. But for us compañeros, all that we can do is see what works, and we can only figure this out if we listen and observe. So some of you saw—those of you who had already arrived during the last session, the closing of the CNI—the compañeros were thinking that someone would officially close the conference. But we hadn’t decided that; those who witnessed this saw that it was the compañeros themselves who closed the congress, we hadn’t arranged this beforehand. So you who were here saw that someone came up thinking to himself, “oh, I want to say something too.” He started off with something adequate for the exchange part of the conference, but people realized this wasn’t the time and place for that, that this was the closing. Soon they got things back on track and closed the exchange. Why? Because this was the will of the compañeros of the assembly, and it is the assembly members who have to close the assembly. These are just some examples of what I’m talking about. We have to figure out what works best and what assures that we feel that we are all equal. None of this business of “I am the most important, or he is the most important.” We don’t think that works. We think this exchange has been an example of how we can do this among ourselves. This is how we go about figuring out how this thing we call a new world is going to be. We have to continue to work on this. As the compañeros of the National Indigenous Congress said: yes, we need to share our experiences, and not only among indigenous people. We also need to share with the compañeros and compañeras of the national and international Sixth. Then we have to figure out how will we share. And we also have to think about those who aren’t part of the Sixth, how will we share with them? That is, how will we respect one another? How will we construct this respect? Because respect is something that we have to build, just as we are doing right now. And I think that we have to provide this example – the compañeros and compañeras of the Sixth in the city, and the compañeros and compañeras of the Sixth in the rural areas – when we come together: to feel as one without losing what we are. Rather, we unite in order to build this world that we want. For example, when we were preparing for this exchange with the compañero bases of support, they thought that (we as authorities) were going to tell them “this is what you are going to be doing.” But no, we had an assembly right where you are sitting now, and ideas started to emerge until we found what felt right, as the compas say, and from that we determined the points to be covered. But tons of ideas emerged in the meantime until together everyone said, “this is it.” That process enriched our ideas so much. For example, our compañeros said: in Leninist Marxism they say that the primary base of capitalism is the means of production, and that is land – or what we call mother earth. But the compañeros disagreed. And we asked them, why not? Because, [they said], we know that capitalism thinks of the land this way, and these guys did us the favour of writing down this idea, but we have to understand that our struggle is to say, hell no! We are not going to allow land to be the means of production for capital. And so what came out of the conversation for those of us who were sitting here then was that the land, mother earth, is the fundamental basis of life for living beings. That’s what we said, because you might remember in one of the encuentros in CIDECI, the late SubMarcos presented a discussion about a can of coke, and in that discussion we said that whatever is a means of production for us we have to take back. And so how are we going to communicate to the compas from the CNI that we have to understand that we must take back the means of production. And so we started to discuss this again. The problem that we face here is has to do with who has the best lands and who takes all of the richness that the land possesses. That is the point from which we began the discussion. But okay, that is just a little part of our conversation, so that you can see how rich it is when we share our ideas in common. I am telling you this because you need to have exchanges. I don’t know how you will do it; it requires organization, work, and thought. But I think that in the space where the compañeros have already agreed to work together, in the space created as compañeros and compañeras of the Sixth, this can be organized, and everyone will have to struggle to communicate their struggle there. You can sense when someone is communicating what they have observed or worked on or lived with the people. And you can tell the difference between that and someone who presumptuously starts from: “the thing is that I,” or that “he” or that “she” and so on. That is, you can tell when an individual is being glorified, but this isn’t really how things work. This is what we have been discussing among ourselves in the CNI, that what we have to do is strengthen the way we were before, to truly represent the compañeros and compañeras. Because they still exist. It is true that capitalism wants to destroy them completely, but it hasn’t been able to. Yes, it has been able to destroy a lot, because it is doing its job. And so we believe that something has to come, another task. You shouldn’t think that we [the authorities] planned this exchange. We didn’t plan it; the compañeros and compañeras did it themselves. The compañeros shared this fact near the closing of the assembly. And this also is something that we want to share with you, the free media, because we realize that when our bases, our people, speak, all that we have to do is support and assist them so that others can see the fruits of their participation. This is what we were doing here, passing on what we call the inheritance. 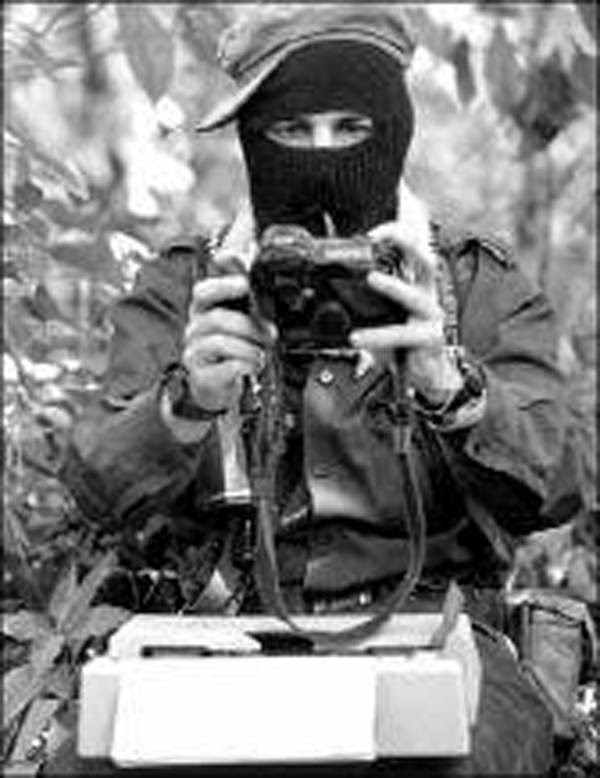 And the only inheritance that we have to pass on is about how to work and to take care for things is our organization as the EZLN and our autonomy. “Well, its better if you do it. Our hope for the Other is that the people organize themselves so that one day it is the people who command, that is, that others do what you are already doing. So you have to share this with our compañeros from the Sixth, with those who do the work of the Sixth. The Other was a campaign that we carried out, that is why it was called the Other Campaign. But with regard to those who actually do the work of what is called the Sixth, which is to organize themselves, struggle, and be anticapitalist, you are the ones who have to share with these compañeros and compañeras. This is what we were discussing, among everyone, and that is where this idea came from. “Well, then, we have to have a little school,” the compas said. And that is how the idea was born, and we decided that we would call it ‘the little school’ because that is how the compañeros thought about it, as a little thing, a little school. And so we were going to give it a try, we were going to do it. And yes, it helped a lot, and many of the compañeros and compañeras, the students who came, now have another way of thinking because they saw things here with their own eyes, not because someone told it to them, not because they saw it in a film, but because they lived it during those hours that they were here. And so certainly these compañero and compañera students who came, maybe they want to share something with us. That is how we see it. But often when we have this type of exchange, sometimes it gets quiet for a few minutes and then we start to ask questions about all of the things that we have already discussed. What did we see? What do we think? What do we believe? So now, compañeros who were here as part of the National Indigenous Congress and those who listened again now, how did you see things? What do you think? And to the media who came and listened to what the compañeros presented in the closing, maybe you have some questions, so that through your questions we can help and clarify whatever isn’t clear. So if you have questions, ask them, and if not that means that everything was clear…or that you didn’t understand anything. Copyleft: “los tercios compas” August 12, 2014. In vitro reproduction, vehicular circulation, and wasteful consumption permitted.